“The Voice” Battle Rounds Season 6 is on night three. Coach Blake Shelton said, “Being a coach is rewarding when you give advice and put it into motion.” Coach Shakira said “it’s most rewarding when she can just give yourself” and enjoy the performance as an audience member. Difficult decisions are made when coaches must decided which artists will remain on their teams. Blake,Shakira and Adam used their steals last week to add artists to their teams that had lost their battles. Usher, who hasn’t used his “steal” yet, said he is “patiently waiting for something that “moves” him. Usher said he loves the battle rounds because that’s when the coaching really comes into play. “Great coaching wins rounds” he said. The first battle of the night came from Team Adam with Austin Ellis vs. Josh Kaufman. Austin came to achieve the American dream and has been working since he was sixteen. Adam was the only one that pushed his button for Austin. Josh is a family man and he tutors on the side for CAT and SAT to make ends meet. All four coaches turned their chairs for Josh. Team Adam adviser is Aloe Blacc. Adam said he chose “Happy” by Pharrell Williams, because it’s a James Brown soul type of song. He said they are two soul singers that can dig into that song. Blacc Austin has a growling tone in his voice while Josh has a caramel tone. The two of them shows how diverse soul is. He said he expects them to have one of the best soul battles. Blake said, “So much energy up there on that stage. Austin that was solid singing and said he couldn’t keep up with all the tricks that Josh had.” He picked Josh. Usher also chose Josh but said Austin’s voice was powerful. Shakira said it was one of the best battles. She said she “was oscillating the whole time going back and forth on who to pick.” Adam joked that he loved that she picked the word “oscillating” and started mocking the motion as if he were an oscillating fan. Coach Adam said, “these guys have the most infectious amazing energy and it’s great to see it on the stage. He said what Josh does is miraculous. I am very proud of both of you guys. I’m forced to make a decision. The winner is Josh. Audra got all four coaches to turn around in her blind auditions. Alaska and Madi are fans of their adviser “The Band Perry”. Blake picked a song, “When Will I Be Loved”, that they can “convey a country lyric and make me believe it,” he said. 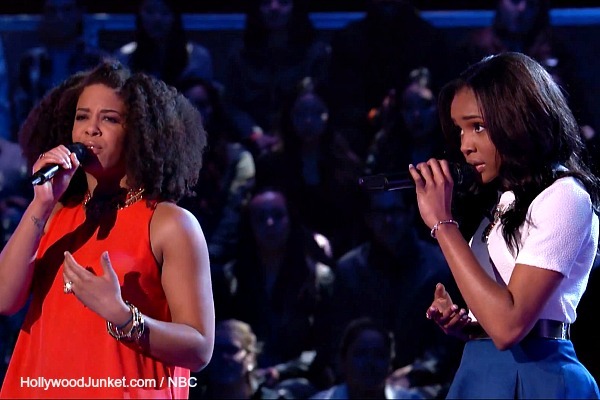 Usher said the battle was “Phenomenal”, and told Audra “you held your own against two extraordinary singers. Alaska and Madi your comfort zone is in singing with each other and you have to find something unique.” He didn’t tell Blake which one he thought was the battle winner. Adam said he’s mad because he has no steals left. Blake said, “you guys are so good and on top of your game. Through the rehearsals you took the notes and did everything that I asked you to do. You blew everyone away. Blake chose Audra as the winner. He said it was the toughest choice he had to make. Blake chose Audra. Blake said he chose Audra because “Audra’s voice comes the closest to the original Country music that I listened to on the radio.” He said there is no one on the radio like that now. During her blind audition, Deja had Blake, Shakira and Usher to turn their chairs. Music Box is a single mother. She said she came up with the alias name “Music Box” to help her overcome stage fright. Their adviser is Miranda Lambert. Shakira gave them “Eternal Flame” song by The Bangles because “I want to know what you’d do with it and want you to explore another side.” Music Box said being older than Deja is an advantage. Deja had trouble attaching the emotion of the song. She said she thought about her family while singing the it. Adam said, “I do believe that both of you guys have special qualities. Deja you are so young. To have so much power at that age is amazing.” Blake explained Deja’s power as, “It’s like when Superman first discovered his power and knocking over buildings. That’s how powerful of a singer you are. Music Box you have already developed your own sound.” Blake said he’s going with Music Box. Usher stole Music Box, “I think you were a bit anxious but your voice is incredible. You just need a bit of coaching. He said he feels like they can go all the way to the end. Their adviser is Jill Scott. Tanner James is 19 years old and Usher was the only coach that turned for him. Tanner and Madilyn are both from Utah and went to the same school, but never met until “The Voice”. Usher told them during rehearsal, “You both have a unique tone, but sound a little bit linear.” He said that they both needed to project. Scott described Madilyn’s voice “like China,” and Tanner has a “very level voice,” she said. Blake observed, “I know for a fact that Madilyn is adorable, but apparently so is Tanner because when he started singing (he got reactions from the female audience members). Dawn and Hawkes are a duo singing pair, but they are also partners in real life. During their Blind Audition, Adam called their performance the best one he’s seen on “The Voice”. Josh is a single father and is struggling to make a living. He’s a full-time musician in a small town he said which is hard. Adam commented on Josh, that he likes the cool gravely tone in his voice but has to make-up for the fact that it’s two against one. Adam selected Dawn and Hawkes as the battle winner. He said, “I think they have a connection with each other. They have a lot of fun. Blues singer Bria overcame a family tragedy when her mother was very sick. Tess is a former NFL cheerleader and came to “The Voice” in hopes of becoming a Pop singer. Singing “Piece of My Heart” by Janis Joplin. Usher gave them the song because “its a unique pairing because it lets them have their own interpretation of vulnerability. Adviser Jill Scott said “Tess has a lot of work to do” and has to let go of her cheerleader facade. Shakira said, “That was awesome. Tess played more dynamics throughout the song. Bria has a more powerful voice. Overall, she thought it was “evenly matched”. Adam on Bria said, “I have a soft spot for you. You were my big loss.” There is something about Bria he said. Blake was impressed by Tess. He said, “Tess came out of nowhere on this thing. Bria did what we expected.” Blake thought Tess “took it” and won the battle. Coach Usher said “Tess you did an incredible job. You made me proud. Bria – I needed to feel the energy and the unapologetic nature that Janis Joplin put into the song. The winner of this Battle is Bria Kelly. He said Bria ultimately connected more to the song than Tess. Watch THE VOICE season 6 episode 11 “The Battles Continue, Part 3” first aired by NBC on Monday, March 24, 2014. This full episode is now available at HOLLYWOOD JUNKET until 06/19/14 courtesy of NBC. ENJOY!